"Giving your conversion a boost and strengthen your customer bonding was never this easy"
With the conversion popups app you can easily boost your conversion and strengthen your customer bonding, by showing a popup/overlay where your visitor can (e.g.) get a discount coupon code after signing up for the newsletter. 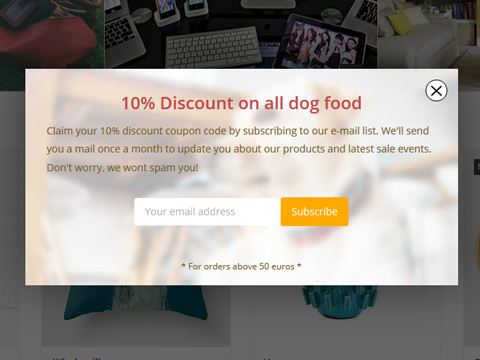 But not only coupon codes will boost your conversion. You can also have a summer sale event, or a gadgets sale event what you want to point out to your visitor. You can now do this in 2 minutes with this app. After installing the app you'll be redirected to the Apps Control Panel. 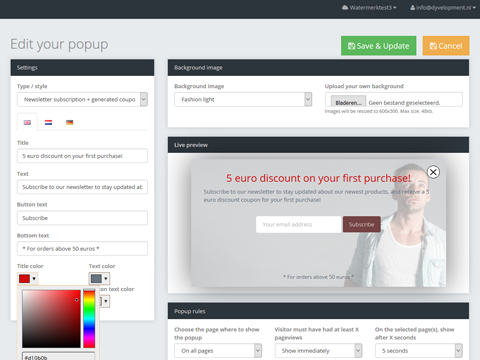 Here you can edit and style your popup to your liking. You can choose colors for text and buttons, and you can use your own background image (size 600x300 pixels). This popup is shown as an overlay on the web page, so it's not a popup that's blocked by a popup blocker. Note for merchants: By using a cookie we determine if a popup already has been shown to a visitor. When you wish to test and preview the app you need to delete your cookies to show the popup again. (For experienced users; it's the cookie dy_popup). 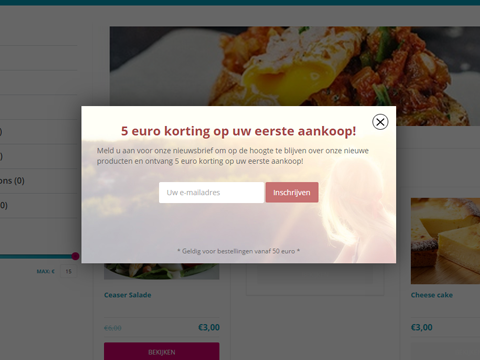 Note 2: it can take a few minutes after savind your popup before changes are visible in your webshop. 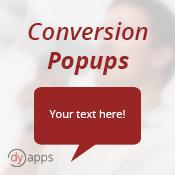 What else can Conversion Pop-Ups do? An informative popup to show visitors there is for example a sale event on sunglasses. Choose on which page the popup must be shown (e.g. on all pages, on product pages, or on the thank you page, and more). You can choose to show the popup only after X pageviews from the visitor, or after X seconds the user is on a page. We're a company that builds and designs beautiful websites and webshops. We're also true Lightspeed eCom experts in case of technical or design solutions. Need a custom solution or extra functionality for your Lightspeed eCom store? Please contact us via our website http://www.dyvelopment.com. This app supports mobile devices and is multilingual. For now the app supports the following languages: Dutch, English, German, French, Spanish and Italian. When a visitor is using an other language no popup will be shown. Check the documentation for details on how to use this app. For quesstions you can also contact us by mail. We'll try to respond as soon as possible.